Several years ago I bought a jacket from GANT, it was relatively expensive and I really liked it (still do). Annoyingly, I put it on one night in the office and the sleeve brushed over a hot bulb, which was long enough to cause a hole to be burned into it. As you can see from the picture… it’s not really something most people would lose sleep over… unless you are a bit nuts like me and you need perfection to ensure mental stability and well-being. The enquiry I sent to GANT was more along the lines of “what can I do? !”, and I was half hoping they’d send me some fabric, or I could send it in to be repaired for a small fee… what actually happened nearly had me fall off my chair… GANT confirmed my authenticity within a few emails and then sent out the same jacket to me in the post!! I decided that a large Harvey Nichols custom Christmas hamper was in order, to thank them for this outstanding level of service, and to this day I am still a huge fan of GANT and their clothing lines. I now own and continue to buy a lot of GANT clothing, particularly for winter and autumn this tends to be my go-to brand. I generally always look at GANT first, whenever I want to buy something new. I highly recommend you check them out if you haven’t already. 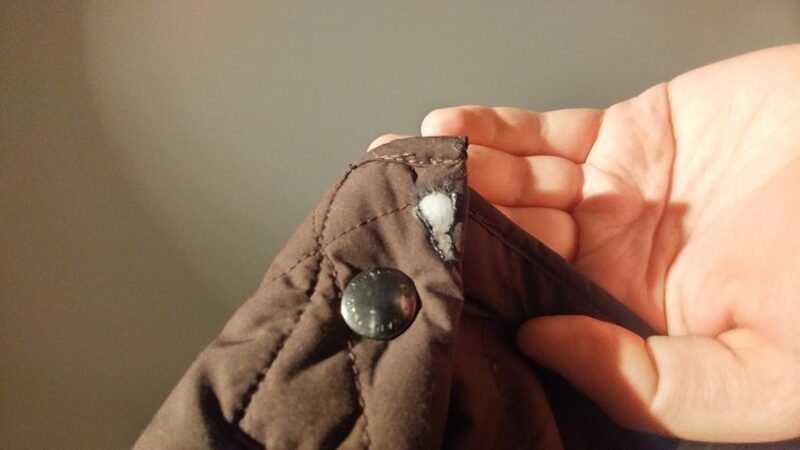 As for my two jackets, I actually ended up sewing up the hole on the burnt sleeve and then wore it out before I started wearing the new replacement… my sanity was still intact, knowing that I could wear the burnt jacket without fear, since the replacement was already within short reach. Unfortunately at this point, both jackets are a bit worn out and they are no longer being made by GANT. On the other arm, it’s summer now and nobody needs a jacket.